The ketogenic diet is a diet low in carbohydrates, high in fat and moderate in protein. The objective is for the body to use fat as fuel rather than glucose. The benefits are endless ranging from weight loss, not having any more cravings and hunger pangs to loads of energy, mental clarity and improved health. There are various versions of a ketogenic diet. But its main characteristic is that it is low carb and high fat. It is not unlike the Atkins diet and also have some commonalities with the Paleo diet. Although the Paleo diet tends to allow foods that are considered too high carb for keto and unlike the ketogenic program does not allow dairy. When we follow a ketogenic diet, we burn fat rather than glucose. When you mostly eat carbs, as we have been told to do over the last 40 years, we burn glucose. If you think about it, our bodies only ever store one day's worth of glucose. Whatever remains is converted and stored as fat. So when we become fat adapted, we cut out the glucose conversion and use fat only. This is a much cleaner energy. To make a major lifestyle change like this, you are probably looking for some ketogenic diet recipes, meal plans and tips. Here we look at some recipes, look at where to find them and have a look at some ketogenic recipe books and programs. You will also be amazed at how good low carb high fat food tastes. When we add fat back into our food, a whole new world opens up. Once you get the hang of these recipes, you will not see a low carb diet as a hardship, but rather as a joy. If you want to jump in, but are not sure where to start, then why not visit our Checklists for guidance. If recipes are what you are looking for, then enjoy these recipes that are a staple for every keto cook. If anyone has ever been on a low-carb diet, they know that bacon and eggs have no carbs. It may not sound like the best thing for you, but for the purposes of the ketogenic diet, they are the perfect food. Here is a recipe that mixes up bacon and eggs and makes it a more interesting, fun and flavorful. This recipe is ample for 4 people. Slice the bacon into strips. Stir and sauté the bacon and veggies in butter for twenty minutes. The bacon should be crispy on and the veggies should be well cooked. Quarter the mixture in four parts in the pan. Put one egg (break it) over each of the four parts. Keep the portions in the pan until the eggs are almost (but not quite) done. When the eggs look almost done, sprinkle some cheese over them and serve. Eggs are very much your friend on the ketogenic diet and you will find that you use them in many recipes. It is a great idea to find someone with a hen house where you can buy them fresh. If you can't do that, buy free range eggs and try to find eggs that are not grain fed. Frittatas are an absolute staple in my repertoire of ketogenic diet recipes. They are easy to make and I can use any available ingredients to make a feast in 20 minutes. This pizza frittata is one of my favorites easy and simple recipes. Warm a non-stick pan over medium heat. Add the pepperoni slices and brown on both sides. Beat the eggs and pour into the pan making sure the eggs cover the pepperoni and sundried tomatoes. Before the eggs set, add the peppers. Scatter some basil leaves, salt and pepper and oregano on top. When the eggs are set, serve and enjoy. You can use any ingredients to make these frittatas. Sometimes I add cheese at the end and grill it in the oven. Other times I fry onion, peppers or low carb veggies. I love olives and capers, so I may add them. These muffins are another very versatile dish. These are great for breakfast or for a packed lunch. Generally they also freeze well. I often prepare a batch of these on weekends, which means I always have a healthy meal or snack available when I am rushing out the door. Turn oven on to 375°F. Grease a 12 unit muffin pan with butter. Pour equal amounts of the mixture for each muffin in pan. Sprinkle a little bit of the cheddar on the top of the muffins. Bake for 20 minutes or until the tops turn golden brown. Let sit for 15 minutes and serve. This recipe makes 6 breakfast or lunch servings or 12 snacks. ​Like with frittatas, you can use almost any available ingredients for these muffins. Add pepperoni, ham or bacon as extra protein. You can also add any low carb veggies like peppers, spinach or broccoli. I also make these without the coconut flour or with nut flowers. These may all appear to be breakfast recipes, but I make them any time of the day. Egg recipes are some of the simplest and easiest recipes on your keto program. They are definitely one of the best sources of both fat and protein and has no carbs. Stock up on eggs and you will always have a good egg recipe to fall back onto. I don't share calories per portion, because I don't really believe in calories. When you truly follow a LCHF diet, you learn to stop eating when you are satiated. This is way more important than counting calories. I also don't share net carbs or fat levels as these will change depending on the exact ingredients. If however you want to know the calories, carbohydrates, fat and protein of any recipe, then you can calculate it here at MyFitnessPal. The ketogenic diet has come a long way. When you search Google, you can find any recipe you want. There are also plenty of delicious recipes on the site, right here. Above you saw my essential ketogenic diet recipes which is my crucial fall back when I don't know what to cook. You should collect a few like these for yourself. Personally, I like to collect recipes from all over the net. I will be sharing the best of the best here. Check back regularly so that you don't miss out on fabulous recipes and meal ideas. When you start out, you probably need some simple recipes and maybe also recipes that breaks down the fat, carb and protein content for you. If you have been following a low carb diet for some time, you are probably more confident and happier to experiment. 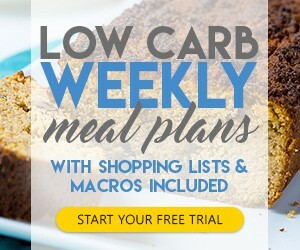 If you are a savvy cook, then you are probably only looking for ideas and we got you covered with these low carb meal ideas. Enjoy our recipes and let us know if we can help you in anyway. Please send us suggestions and recommendations if you think we can improve our recipes in any way. Just have fun on Google. Search what you want to make and develop the recipes into a master piece that works for you. If you are more of a novice cook or are worried that you will make mistakes then the Keto in Five eCookbooks that we share below and could be a great fit for you. Since I started Keto, I spent more time in the kitchen. But that doesn't mean that I spent hours making complicated recipes. It is important to plan and prepare. If you know you won't have time during the week to prepare food, then use your weekend time and prepare food for the week. Some perfect meals to prepare in advance are the essential ketogenic diet muffins I shared above as well as lasagnas, casseroles and curries. 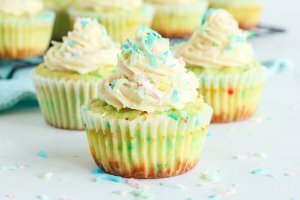 There are many very elaborate keto recipes, but there are also the simple 5 ingredient type recipes. I love these because when you can keep it simple most of the time, it is easier to successfully make the changes needed to adjust to your new lifestyle. Some books or programs provide you with a number of recipes for specific meals like breakfast, lunch and dinner. Others are packed with recipes for bread, which for many people is the toughest thing to give up, desserts or fat bombs. Fat bombs are little morsels made mostly of fat and is useful when you struggle to incorporate enough fat into your new eating plan. Others are complete programs that explain the concept of a ketogenic diet, provide specific meal plans and also recipes. 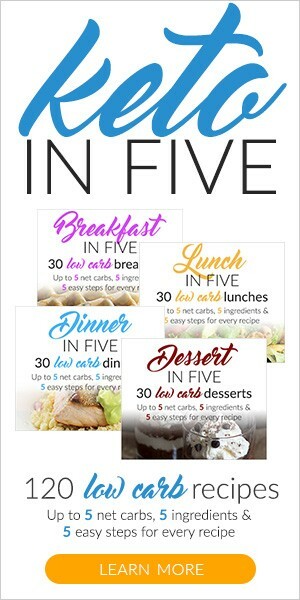 On the one hand Keto in 5 offers you the option of weekly meal plans with everything you need to get you going. But they are best known for their Keto in Five's breakfast, lunch, dinner and desserts cookbooks. Tips to keep you going. Perfect for someone who wants all the guess work taken out of their meals and want enough variety so they don't get bored and give up. 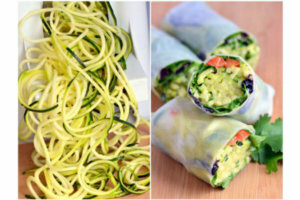 Each made with 5 ingredients, 5 steps to make them and less than 5 grams of net carbs each. Perfect for someone who wants to cook simple and delicious meals with little fuss and who doesn't want to be overwhelmed with lots of information. Another source for amazing ketogenic diet recipes is YouTube. I like to search YouTube for recipes, not only because they have great recipes, but I also like to watch how stuff is made. I hope you are enjoying these recipes. Try them, experiment and have fun. It is important as you make this new lifestyle your own that you eat well and don't feel cheated. What I love about the ketogenic lifestyle is that I can eat as much delicious food as my body needs. Find yourself a good base, some good ketogenic diet recipes that you and your family love and give yourself the nourishment that you deserve. And if you need reminding why Keto, then read this summary about what the keto diet is. ​While a state of glycosis causes the body to use sugar as its main source of energy, the state of ketosis encourages the body to use ketones as its energy source. This essentially means that by adapting to a ketogenic diet, you're burning fat, whether from body fat or fat that can be found in the foods you eat, rather than carbohydrates. As mentioned earlier, we only have so much glucose stored in our bodies. And once our muscles and liver run out of its 24 hour supply, there's nothing left to burn but body fat. 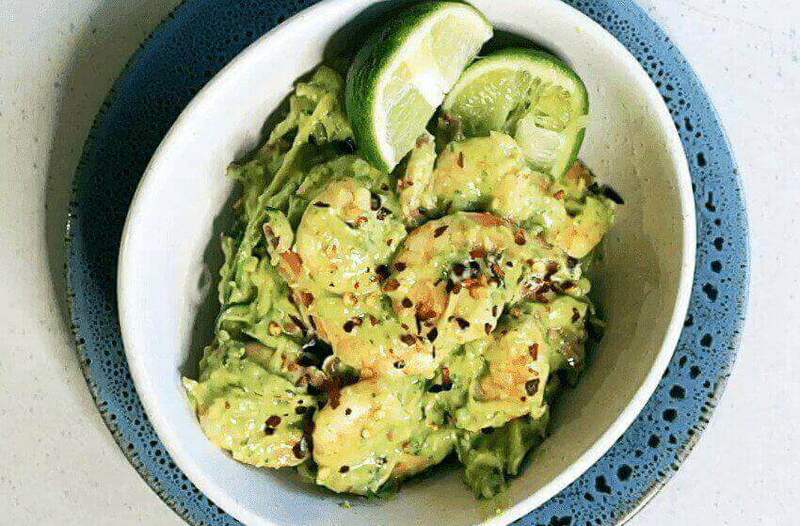 So if you're interested in getting a boost on your weight loss, then the Ketogenic Diet is ideal and these Ketogenic Diet Recipes are just what you need. It's an excellent way to quickly lose those extra pounds.